COLUMBUS — On a night when each team scored two power-play goals, it was a critical penalty kill by the Ottawa Senators that led to the game-winner. The Columbus Blue Jackets had overcome a two-goal deficit and tied the game 7:16 into the third period on James Wisniewski‘s power-play goal. They got a chance to go ahead when Zack Smith went off for high-sticking Ryan Johansen with 9:13 remaining. But Ottawa’s penalty-killers held the Lightning without a shot, and Nathan Horton was called for tripping 21 seconds after the power play ended. Jason Spezza capitalized by scoring with 4:58 left in regulation, giving the Senators a 3-2 victory Tuesday night. Spezza, who assisted on the second of two goals by Stephane Da Costa, took a centering pass from Colin Greening but his shot hit the stick of Columbus defenseman Fedor Tyutin. His second try hit Tyutin’s skate, but the puck came back to Spezza again and he scored his 14th goal with six seconds left on the power play. Spezza then had a bigger-than-usual goal celebration. 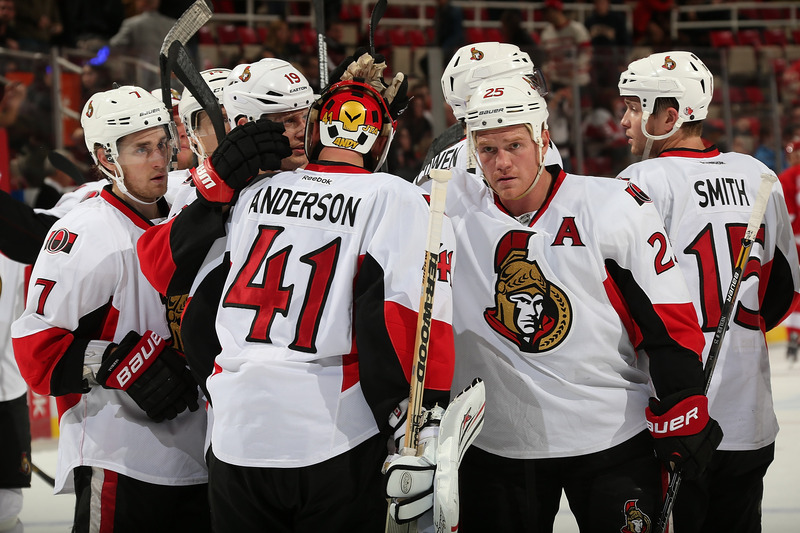 The Senators went 2-for-4 with the extra man, boosting their League-leading road power play to 28.6 percent. Ottawa is last in the NHL on the power play at home (11.8 percent). Ottawa (23-20-10) also got 34 saves from Craig Anderson to end a 0-1-1 stretch. Columbus (26-23-4) has dropped three games in four days after a team-record eight-game winning streak. The Blue Jackets lost 5-2 at home to the Buffalo Sabres on Saturday and blew a 2-0 third-period lead on the road Monday night in a 3-2 loss to the Carolina Hurricanes. The loss to the Senators came in their 10th game in 19 days. Not that center Brandon Dubinsky was using fatigue as an excuse. “These last two games are maturity. I’m not saying maturity because we’re young. I’m not saying that as an excuse,” he said. “Buffalo happened. We sort of washed that off our back. Then we come out and have a great start and have a two-goal lead in Carolina and we backed off. We thought it would be easy. We thought we were better than we were and it came back to bite us. The Blue Jackets got off to a slow start, and coach Todd Richards said it wasn’t hard to figure out why. Da Costa, recalled from the Binghamton Senators of the American Hockey League on Jan. 20, scored his first two goals in eight games with the Senators this season. He opened the scoring at 8:06 of the first period with a power-play goal. Da Costa was the beneficiary of a rush by Milan Michalek while Matt Calvert was off for holding former Blue Jackets defenseman Marc Methot. Michalek was checked off the puck in the front of the net, but Da Costa was trailing and swept a backhander past Columbus goalie Curtis McElhinney, who had 25 saves on a night when starter Sergei Bobrovsky was rested. Da Cost put the Senators ahead 2-0 at 6:24 of the second period after strong forechecking forced a turnover deep in the Columbus zone. Spezza collected the puck below the goal line and fed him for a bang-bang goal when Da Costa shirked the check of Columbus defenseman Jack Johnson. The Blue Jackets got back in the game when Cam Atkinson scored a power-play goal 12:00 into the second period with Spezza off for holding. Atkinson drew the hooking call on Smith that led to Wisniewski’s tying goal.